Are you having trouble keeping track of everything that’s going around in Azure? You’re not alone! In an effort to do so myself, I’m starting a monthly series called “News for developers” which is exactly that: a summary of all of the Azure flavored news specifically for software developers. Now this is based on my personal feeds and my personal opinion, so you might miss things or see things which in your opinion do not matter. Feel free to leave and comment below and I’ll see what I can do for the next edition. And honestly, this is more a personal reference than anything else so having actual readers would already be awesome 🙂 Enjoy! .NET 4.7 is now supported on Azure App Service. For more information about what 4.7 brings for you, check out this post. .NET Core 2.0 Preview 2 also rolled out to Azure App Service. For more information about that release, click here. Durable Functions are on App Service now. These are built on the Durable Task Framework which allows writing long running workflows using async/await operations. For Functions, this brings us a way to facilitate longer running processes on Functions, which was not possible previously. Check out this post for more information. NodeJS versions have been updated to include v4.8.4, v6.11.1, v7.10.1 and v8.1.4 along with the corresponding NPM packages. These updates provide a fix for a known vulnerability. Azure App Service Environment (ASE) v2 has been released. Most important changes include scaling based on the App Service Plan (managing worker pools is no longer required). 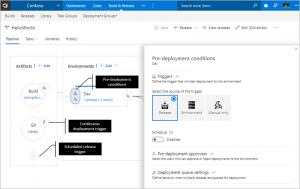 The creation process is now integrated into the Create new App Service Plan experience, increasing the visibility. And the new ASE can scale to bigger, which is of course better 😉 Check out the blog post here. A preview of App Service Domains makes it easier to combine Azure DNS hosted domain names with your app service instances. A few of the benefits include: subdomain management, automatic renewals and free cancellation within 5 days. That post is over here. The app services team now keeps track of their updates in blog posts and in this github repo! And you can find a monthly update on their blog as well. There’s a new editor for release definitions and an updated workflow for pull requests. The editor I already used myself and it’s a pretty sweet visual representation of the release flow in your application. Check it out! Upon completion of a pull request, you can now automatically mark all linked workitems as Done. Get it done! Also in the PR department: a policy now allows an automatic reset of reviewer votes when new code is being pushed. Personal favorite: you can now view the original diff of a file once a code update has been pushed. This makes it a lot easier to check out changes to the code which you commented on previously. Multiple updates to task groups include: versioning (draft), references and import/export of a task group. Check out https://www.visualstudio.com/en-us/articles/news/2017/jul-14-team-services for the complete overview. John Papa (yes, the one and only) released Azure Function Tools for Visual Studio Code which allows you to use TypeScript within your Azure Functions. Download it from the marketplace here. For all of you Angular folks out there, Angular version 4.2 is now available. In the “services that might come in handy one day” department; Microsoft Stream has been made generally available. Stream offers powerful video streaming services combined with intelligent stuff like automatic captioning, face detection and other AI features. Click here for more.